Entered Service At: Ionia, Mich. Birth: Ionia, Mich. Date Of Issue: 29 January 1896. Went to the assistance of a wounded and overpowered comrade, and in a hand-to-hand encounter affected his rescue. Sgt. Alonzo Woodruff was born on March 3, 1839. His place of birth was Farmington, Michigan. Sgt. Woodruff enlisted in the US Army at Ionia, Michigan. 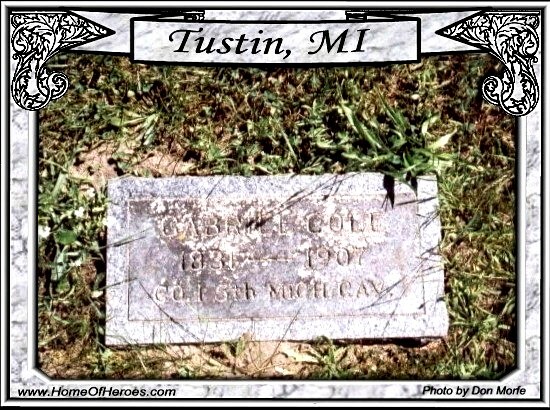 His burial site is at the Valley Cemetery, Ellsworth Twp., Lake County, Michigan. Sgt. 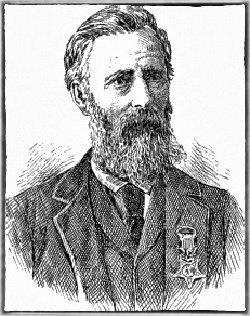 Woodruff became the recipient of the Medal of Honor for his acts of heroism during the Battle of Hatcher’s Run on October 27, 1864. He received the citation 34 years later, 1898. The siege of Petersburg was in progress nearly four months, when, on October 27, 1864, the Army of the Potomac began to extend its lines to Hatcher’s Run. Its mission, destroy the Weldon Railroad. The Second Corp and the Second Division of the Fifty Corp advanced on the left flank, forced a passage at Hatcher’s Run. At this point bloody combat ensued between the two armies. The Union lost about 1,200 in killed and wounded; the Confederates lost 1,700. Sgt. Alonzo Woodruff and a Cpl. John Howard were on the extreme left of the Union lines. They fired, but before they had time to reload the enemy was upon them. Cpt. Howard charged and caught one of the Confederate soldiers and attempted to take his rifle. In the scuffle, Howard suffered injuries to both of his legs. Sgt. Woodruff came to the aid of his injured comrade and became involved in a clubbing hand to hand combat. Sgt. Woodruff removed Cpt. Howard to safety. Right after this last mentioned incident, Sgt. Woodruff came to the aid of another fellow soldier. This time, N.J. Standard, also assigned to his company was wounded and taken prisoner. He charged single handed into the Confederates, freeing Standard and took Standards captor a prisoner. Sgt. Woodruff was severely wounded during the rescue of Standard and required medical treatment. Sgt. 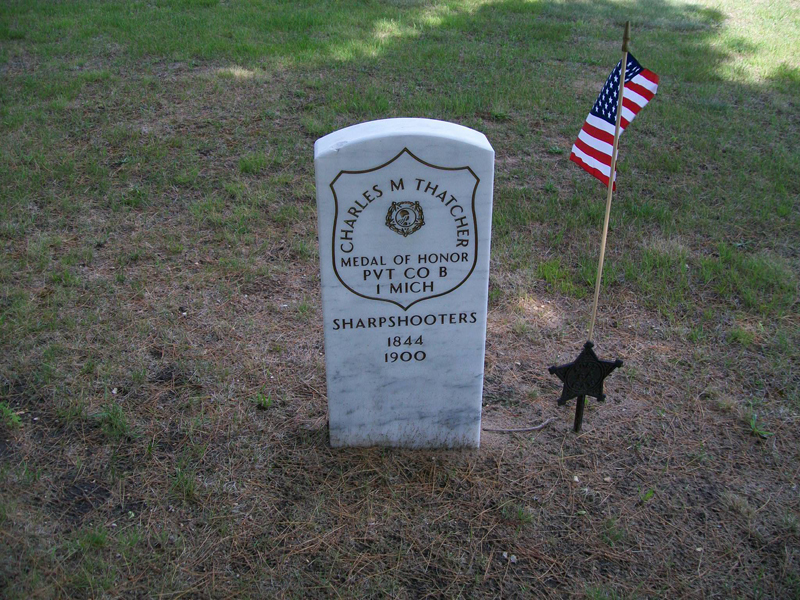 Woodruff was a member of an elite group of rifleman, known as “Sharp Shooters”. These men were able to accurately hit targets at 1000 yards. There are documented hits of their foe at 1700 yards. Sgt. Woodruff served in The Army of the Potomac. The theatre of war for this army was in places known to most all of us; Gettysburg, Antietam, Wilderness, Cold Harbor, Richmond and Petersburg, plus many other places in between. Being an old artillerist, aided General Bartlett in working the guns of the dismantled fort. Accredited To: Illinois. G.O. No. : 45, 31 December 1864. Served as seaman on board the U.S.S. Signal which was attacked by field batteries and sharpshooters and destroyed in Red River, 5 May 1864. Proceeding up the Red River, the U.S.S. Signal engaged a large force of enemy field batteries and sharpshooters, returning their fire until the ship was totally disabled, at which time the white flag was raised. 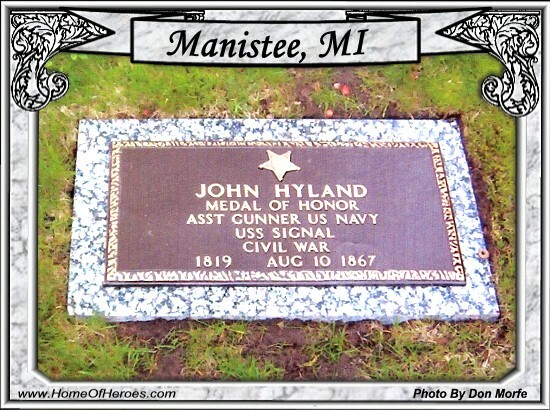 Although wounded, Hyland courageously went in full view of several hundred sharpshooters and let go the anchor, and again to slip the cable, when he was again wounded by the raking enemy fire. Entered Service At: Eastmanville, Mich. Date Of Issue: 31 July 1896. Instead of retreating or surrendering when the works were captured, regardless of his personal safety continued to return the enemy's fire until he was captured. Gabriel Cole lived in Sherman Township, about 15 miles south of Cadillac, Michigan. Gabriel was born in Chemung County, New York, in 1831, and lived in Salem Township, Michigan, when the war broke out. 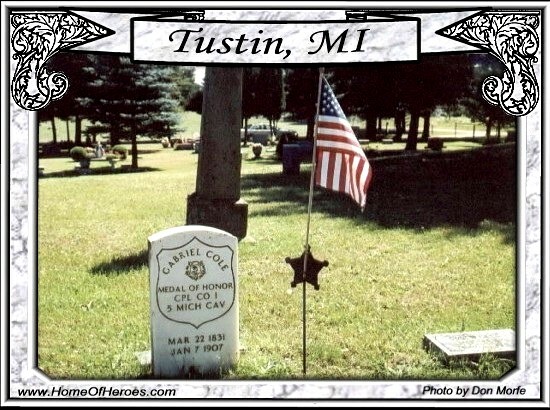 He enlisted at Allegan, Mich., August 19, 1862, as private in Company I, of the 5th Michigan Cavalry. 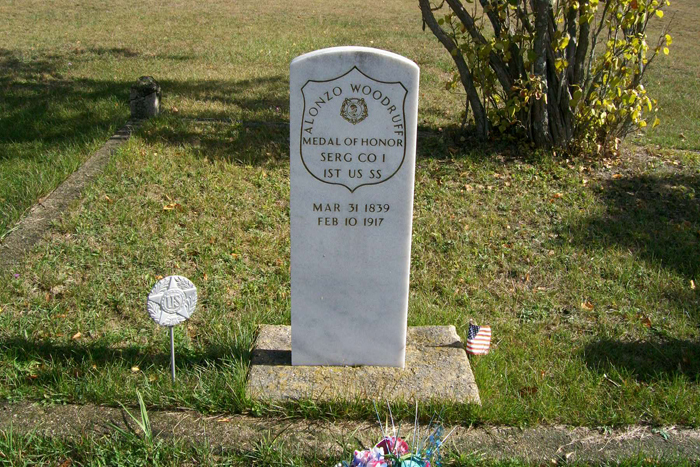 September 19, 1862, on the day when he earned his medal of honor, he was promoted corporal of the same company. "In giving you my story I am obliged to depend entirely upon memory, for I have no notes to which I can refer. Our regiment was in the 1st Division, commanded by General Wesley Merritt, 1st Brigade, under General Custer. Sometime during the early part of the evening of September 18, 1864, our officers awakened us with orders to saddle, stand to horse, and be as quiet as possible. We were then somewhere in the vicinity of Opequan Creek. It was about two o'clock on the morning of the 19th when we took up our line of march very quietly. Just at daybreak the band, which was in front, began to play "Hail Columbia," and as the sun rose they struck up "Yankee Doodle" but did not play it more than half through before they went suddenly to the rear, and we to the front, where we had a sharp fight at the creek, charging by, fours across the water-way, up a sort of ditch to where a ravine crossed it. We were forced to turn a sharp corner half way up the hill, and at this point had three or four men wounded and four horses killed. On arriving at the top we formed in platoons, unslung carbines and went to work pumping lead as lively as we knew how. All the shelter I had was a small oak tree, about the size of a stovepipe, which was slivered from top to bottom by bullets. French Lewe, of Company C, who stood within a few feet of me, was shot through the head, and when the bullet struck him the sound was similar to that of running a knife through pasteboard. Captain North commanded our battalion, and gave us orders to retire to the creek. General Averill with the 2nd Division was on our right, and we were forced to wait until he formed line with us. One of the boys from the 1st Michigan was shot through the body, and Captain North called upon some of us to help carry the poor fellow to the rear. I turned my horse and carbine over to the captain's orderly, and with Captain North, a sergeant of Company C, and one other comrade, picked him up and carried him about ten rods, with the bullets flying like hail, and making all kinds of noises. Then we found a dead horse, took the blankets from his saddle, and made a stretcher on which we conveyed the wounded man to the creek. On reporting after this service, we found our command lying down in a ravine, while the Confederates kept the air full of bullets. Captain Charles Safford had his cap split open, and the missile just grazed his head. He thought it was a close shave, and we all agreed with him. We were halted in that ravine about an hour, I think, when General Custer received orders to advance, and we went over the same ground once more. When we came to the spot where French Lewe was lying, we found that his body had been nearly stripped of clothing. The bugle sounded "Trot, march, gallop, charge," and away we went through the woods, over fences and ditches, every man apparently trying to get at the enemy first. We drove them to the vicinity of Stevens' depot, where they made a stand- we charged, but they formed a hollow square, and we were obliged to go to the rear. Then the artillery knocked the hollow square into a cocked hat, and we charged again. His color-bearer's horse was shot and fell on the poor fellow - Sergeant Bachelor of my company. "Boys, give them hell," and we did. We emptied our weapons into the mass of enemy in front of us, and looking around, discovered that the command had fallen back. By that time we had learned this much - Ed Hastings and I were alone. We decided it was not healthy to stay there much longer, and so we galloped toward the rear and over a knoll, which was literally being plowed by the shots and shells. We got across all right, however, and then came the question as to where our command was. Ed Hastings thought it was down the pike, and I felt positive it was in the other direction. So I went up until I met the provost guard. Ed went the other way, and told me afterward that he found Captain North mortally wounded, and saw him die. I joined our brigade after a while, and then we were formed into two ranks, the sharpshooters in front lying close to the ground. General Custer gave the command. "Front rank lower sabres!" - ''Rear rank raise sabres!" Looking to the right as far as we could see was the unbroken line of cavalry, and to the left, infantry and artillery. "When we charge, yell, I don't give a damn whether you fight or not; but yell loud!" "Come on, boys!" and we went. The Confederates could not stop us this time; we had taken a good many prisoners, when one tall, six-footer objected to surrender to me. He clubbed his gun and came for me with his eyes shining like a cat's in the dark; but, thanks to my trusty sabre at head parry, missed his calculations. I then showed him the beauty of carte point, and he jumped backward about ten feet; but made up his mind to try it again, when Comrade Wheeler of Company G, gave him a left cut which sliced off his hat, and the last I saw of him he was lying on the ground trying to hold his head up with one hand. Wheeler intended to kill him, but I told him to let him go. I thought he had had enough for one spell, and advised Ed to come with me for some flags which we could see just ahead. The poor fellow was badly wounded even then, and a few days afterward died. I didn't think at the time he was hurt very much, so left him and went for the colors. I rode at full speed, my sabre at front cut, my left hand free to catch the flag. The Southerner understood what was coming, and sprang forward. A moment later I had the flag, and he had the staff. At that instant my horse went down, struck with two bullets. I helped him up, and was trying to discover where he was wounded, when I saw under his neck a glimpse of something which caused me to right dress mighty quick. As it was I received a severe flesh wound in the left leg just above the knee, from a bayonet. I raised my carbine, and the Johnny flew for cover. He needn't have run so fast though, for I had used up all my cartridges, and the carbine wasn't half as good as my sabre. The wound he gave me smarted and burned so that it made me mad, and if I could have got hold of him just then I believe he would have been hurt. I stuffed the flag under my blouse: but it was so big that some of the tassels hung out. As I started to the rear I found a little sorrel horse from which a sergeant of Company K had been shot, the saddle being covered with his blood. While mounting, a lieutenant of Company B rode up and asked me what I had. I told him and he said: "Bully for you, boy! Let me carry it to Custer." I gave it to him, and joined my company. This was about five o'clock in the afternoon, and the enemy was in full retreat toward Fisher's Hill. We followed until nearly midnight then went into camp, made some coffee, and slept about two hours. The next morning my wound pained me so badly that I could hardly move, and our surgeon was at Winchester attending to the wounded. I went to the 7th Michigan, where I got fixed up. General Custer sent for me while I was there. I reported as soon as possible, and he asked for the particulars concerning the capture of the colors. After I told him, he cut one of the stars out of the flag, and an officer asked him what he was going to do with it. He said he intended to get enough stars, taking one from each captured color, to make a whole flag. The standard I took was the regimental flag of the 46th Virginia, with two red stripes, one white one, and a blue field, on which were eleven stars. Sergeant Henry Fox of Company M of the 5th Michigan also got a flag. General Custer ordered us to report to General Torbert, chief of cavalry, and when we arrived at his headquarters we met several others from different regiments. 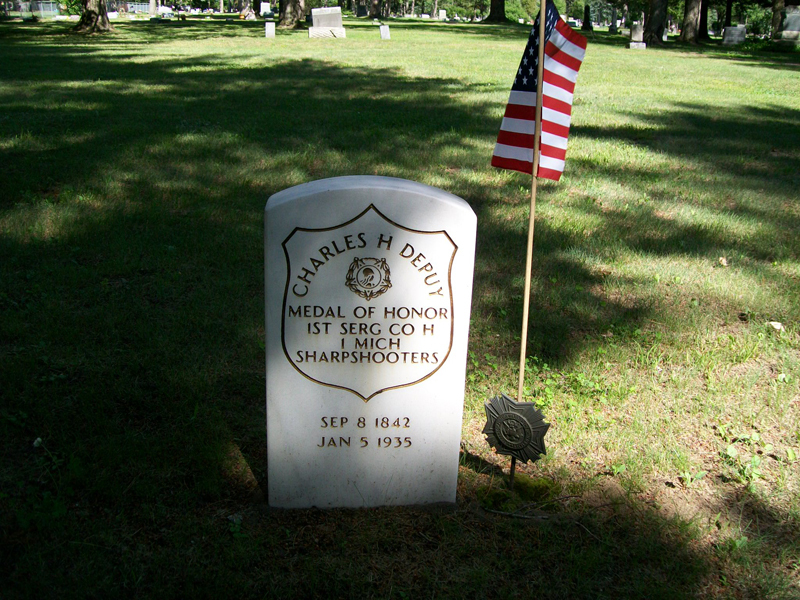 I remember only one, and he was Chester Bowen, I think of the 2nd New York Dragoons. A lieutenant in the Regular Army took charge of those who had captured flags, and a company of the 4th New York Cavalry escorted us to Pleasant Valley, where we turned our horses over to the quartermaster, and took the train to Washington, arriving there about dark. The lieutenant said: "Boys, go where you please, but report at Willard's Hotel tomorrow morning at nine o'clock sharp." We reported as ordered, and went from there to the Secretary of War, to whom we presented our flags. He shook each fellow by the hand, and thanked him in the name of the people and Congress; gave us the liberty of the city for five days and nights, after which we were to report to him and receive our medals of honor. When we saw him the second time, we got, in addition to our medals, a recommendation for a thirty days' furlough. When I reported to my regiment, Surgeon St. Clare told me I was foolish to come to the front with such a wound; but I said I could not bear to be left behind while the other boys were fighting. He replied: "All right. Report to me every morning, and I will soon have you fixed up." I remained with the regiment from that time until April 6, 1865, at the battle of Sailor's Creek, when I was terribly wounded by a minie ball in the left side, and my horse was killed at the same time. I was discharged from the hospital at Annapolis, June 27, 1865."